Look Back in Mild Bewilderment: Can WBA spend £10m on a player? Can WBA spend £10m on a player? The club's income is set to rise because of the new Premier League TV deal assuming that all other elements of the club's income remain constant the deal will guarantee about £15m in additional income. However that is only guaranteed provided the club stay aboard the Premier League gravy train. Whilst it is safe to assume not all of the additional funds will be available to sign players as there are a number of new contracts in the pipeline. However this is offset by the departure of a number players from the current squad and there will be some additional income generated by transfer activity. The new income is certainly sufficient to cover the additional the first year costs of a £10m player. Assuming they are bought in on a 4 year contract and earn £2m a year the cost of the deal is roughly £4.5m in the first year. If spent entirely on players the additional funds could cover the purchase of three players on that basis. I would concede that it would cause havoc with the club’s cash flow position because although the fees are accounted for over the lifetime of the player’s contract they fall due in much shorter order therefore to balance the books in the short term we would have to borrow the money against future earnings. So three is totally unrealistic but one would be possible providing not much else was spent on fees. Before anyone gets excited about who that means will be heading for the Hawthorns this summer I think it might be worth pointing out that every agent and club can do what I have just done and work out that even quite a modest Premier League club is loaded and adjust their demands accordingly. The Van Wolfwinkel deal at £8m might set the tone, real value for money in the market might be difficult to find. Equally the club needs to be mindful that importing talent on higher wages will lead to higher wage demands in the future from the current squad so it is not just the current deals that need to be funded but any future deals that will be impacted by them. The club might be wise not to throw all of their new found wealth at one transfer window and as ever it will operate prudently but there is no doubt money will be available. Over the last few years Albion have been successful in building the squad by using free transfers and loan signings supplemented with the odd big money signing. To do this most of the player budget has been spent on wages. Ultimately being able to offer competitive wages is the only thing that will allow us to bring in the players we need to maintain our top flight status. In general Albion will not spend significant fees on players in their late twenties and early thirties because if the deal does not work out the club will struggle to recoup the fee. For the club to be willing to pay a significant fee the player would need to be an established first team player and under the age of 26. One key advantage of focusing on wages rather than fees is that in the event of relegation wages flex down but the fees don't. Paying a fee of £4m for a player on a salary of £1.5m a year over a 4 year contract gives an annual cost of £2.5m. If Albion dropped into the championship the players wages might fall by 50% to £0.75m but the fee would still be amortised at £1m a year so the cost would be £1.75m. Paying the same player on a free transfer £2.5m a year with a 50% flex down clause in the championship would cost £1.25m in the event of relegation. No purchase in football comes with a guarantee beyond the poorly researched, overpriced panic buy, at the end of a transfer window nearly always fails and if you bet your house on a marque signing you will lose your house. The fee paid is a very poor indicator of success and in certain circumstances the fee itself adds pressure to the player and becomes one of the reasons for their failure. The reality of being a mid-table Premier League side is that the best players in their position are drawn to the twenty or so richest clubs in Europe and the truly gifted are the preserve of an even smaller elite. By definition most Premier League teams are recruiting average to good players in effect there is a ceiling on the quality of player that a team like Albion can sign. However there is no limit to the money that can be spent on them in fees and wages as QPR and others have shown through the years. I believe the Albion hierarchy have pretty much adopted the following as a blueprint. This might seem like the ultimate statement of the bleeding obvious but too often clubs sign players who are nice to have but have no clear role in the existing team, and surprise surprise the transfer fails. A new player must always add something to the existing squad and not just replicate what is already there and if he doesn't well don't do the deal. The Borja Valero deal springs to mind whenever I see a club buying a player that does not seem to meet an obvious need. This is an on-going process there is no point in starting to look for a left back only when you need one because yours has just broken his ankle in a preseason friendly and time to find a replacement is running out. To maximise the chances of success the leg work is carried out months and even years in advance so not only can the club identify targets for positions they know they will need but to cover for unanticipated departures or injuries. In depth scouting is essential and not just in assessing the player's footballing ability but also his character which will be key to him settling into his new club and will also expose any off field problems which might undermine his ability to perform. It never ceases to amaze me that football clubs are surprised by some of the baggage their new signings bring with them. After all they are investing millions in the player a little bit of due diligence would not go amiss. Placing the recruitment process in the hands of one man particularly an old school British gaffer is a recipe for disaster. Obviously the Head Coach does have a pivotal role in identifying areas for improvement but no coach not matter how dedicated can cover the whole market and too often Head Coaches get trapped into the notion that they must have player x partly because they are unaware of the alternatives and partly because of ego, any challenge undermines their authority at the club. Equally managers will always over estimate their ability to turnaround wayward players and without a challenge from either a Director Football or an independent chief scout tend to overlook flaws that others might see. This follows naturally from points 2 and 3. When negotiating a deal for a player it is a lot easier to walk away from a deal that is becoming too expensive if you have an alternative and in many cases there will be very little to choose between potential recruits, although the price will vary. Albion along with other mid-table clubs should wherever possible focus their efforts on finding players abroad or from championship clubs who regard joining Albion as their big break. The problem with taking established players from the bigger clubs both home and abroad is that often the player concerned is on the downward swing and joining Albion from Chelsea Man U or Milan pretty much confirms it. Very few players leave one of the bigger clubs for a mid-table team and subsequently return to a team challenging for a champions league place. I can only think of one and that is Scot Parker, which would suggest few recapture the form that got them their break into the elite in the first place. There might be a whole host of reasons for this but there must be an element that the players have lost a bit of hunger or desire, it is not to say they are not dedicated and model professionals but nor do they think they have anything to prove. There is no signing that a mid-table club can make that will guarantee their future in the Premier League so don't commit to deals that can only be sustained if the team is in the Premier League. This means two things. Firstly all players contracts have a flex down clause in them and if the players does not want to sign on that basis do not sign them, secondly if a fee is paid either there is a chance that it could be recouped or if that were not possible then club will not pay a fee that would cripple it if the fee had to be written off during a spell in the Championship. The policy implication on fees is fairly straight forward in general terms once a player reaches his late twenties the less inclined the club is to pay a significant transfer fee for his services. Once upon a time following his team's FA Cup triumph someone asked Coventry manager John Sillet what the victory meant to the club he replied "Coventry City have shopped at Woolworth’s for too long, from now on we're shopping at Harrods" There is no virtue in abandoning a tried and tested modus operandi just because of a sudden windfall and in particular when mid-table clubs start to make one big marque signing at the expense of making a number of improvements across the squad it is a sign that the club is about to lose the plot. Many fans and commentators believe that it is a big summer for Albion because there are obvious gaps in the squad because of player departures. I would not disagree but I believe that the club has the systems in place to fill the gaps. 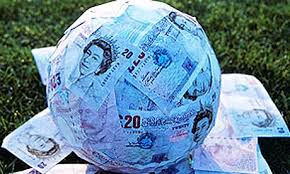 Those fans that are looking to the club to splash the cash on established Premier League players are still likely to be disappointed but it is no longer completely impossible. I would not be surprised if Albion break their transfer record this summer but I do not think we will break the 8 figure barrier, it would be possible if all we needed was one standout recruit but that is not the case this summer.